Now here's a good way to boast of your general funniness! Funny tin signs for college dorms are perfect for complementing your sense of humor, which should be very active during dorm life. Have some fun while in college by decorating your dorm room with cheap tin signs for college that are witty and cool. 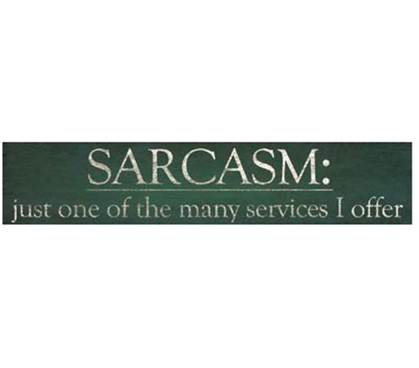 This Sarcasm Service - Humorous Tin Sign is great for bringing some fun to your dorm room and serving as a dorm wall decoration. It's a cheap dorm item but will be a college item that's with you throughout college life.